Fernville House (corner of Milton and Irwin) was recently featured on Shaw Cable for Heritage Week. You can check out the clip here. Hot off the Press! The 2011 South End Calendar! 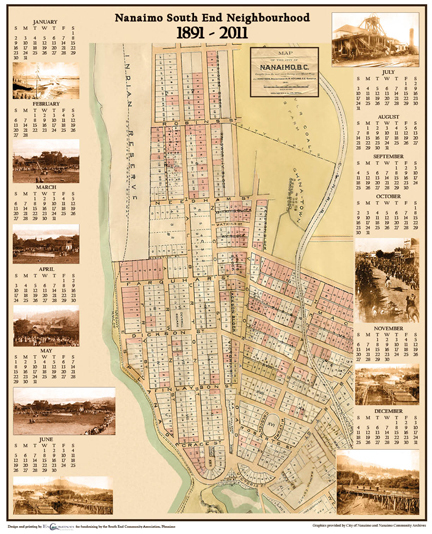 The super exclusive and hopefully-soon-to-be-highly-coveted south end calendar is available – the commemorative 1891 -2011 edition (the map is from 1891). To order your copy in advance, please call David Scott @ 250.591.8471. Same incredible deal as last year: $10.00 each. Our regular monthly meeting will be Wednesday October 6 @ 7 PM at the Princess Royal Centre, corner of Farquhar and Irwin. 3. Review the new development application. George Leu from the Ministry of Environment will also be there to report on the testing that has been carried out. If this interests you, please come and invite your neighbours. This will be your best opportunity to keep updated about how this will impact you and those around you. I’ve heard people rave about the work that Fred and Bonnie Cappuccino do. Founders of Child Haven International, and recipients of the Order of Canada, often the talks I have seen are held in Parksville. But they will be closer to home on October 23, doing a presentation and selling exotic items at the Unitarian Hall on Townsite Road. Admission is free. March 1 – 14th, 2010 All McDonald’s Restaurants across Canada will be offering free coffee from opening until closing. No purchase necessary, for dine in or take out. That’s 14 days of free small coffee. Mark off May 8 on your calendar. A great day for kids to learn about nature. More details to come.